Jeff was born in Boston and grew up in Miami. As a kid he was into music, sailing and science. He played drums for several bands including FLOOR. He moved to Atlanta to attend Georgia Tech and received his degree in Physics in 2003. Prior to opening Ember he was a partner in a Woodstock based engineering firm. Jeff took his first Bikram yoga class in 2008. After about the first thirty minutes he was on his back for the rest of the class. It took several weeks before he was, inexplicably, drawn to take another. That pattern continued for a short time before he committed to a regular practice. The commitment came from a desire to take control of his physical health. To take it away from a revolving door of gym routines and diet strategies and put it on a solid foundation. For him yoga proved to be that foundation. It started the process of optimizing the body inside and out; reducing blood pressure; building core strength & flexibility in the right proportion & locations in the body; directing appetite to plant based & healthy food choices; reducing stress; and boosting almost every physical measure of health. Once his physical health had found a strong foundation, for Jeff yoga opened a door to a more subtle understanding of his practice and yogic path. It created a space for exploring a deeper understanding of mind, body and spirit. 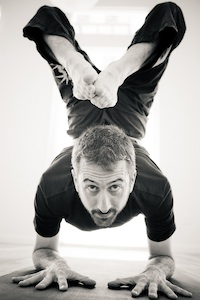 This led Jeff to the practice of Ashtanga Yoga and then, inevitably, to his teacher Sri Dharma Mittra. Jeff studied with Dharma, his senior teachers and an amazing class of sadhakas in New York in 2010. Dharma’s approach to the practice of yoga through ahimsa (do no harm) and his ability to transmit the practice in its purest form has become a beacon for Jeff along his yogic path. It continuously inspires him to go further and learn more. As a result, Jeff values studying the words of great teachers and karma yoga as integral parts of his practice. He is also inspired to continue developing as a teacher in order to share the rewards he has found through his practice with others.